My first tote bag from LL Bean is yet to arrive because I availed the services of another cargo forwarding company. A few weeks after, I was planning to purchase another bag. This time, I wanted a bigger tote in another color. While searching for photos and blog reviews about LL Bean, I accidentally discovered another brand. Fellow bloggers led me to another US based company that produces the same classic canvas bags. I discovered Lands’ End line of Canvas Totes. To be honest, my loyalty to LL Bean was easily swayed by Lands’ End. I love the design of Lands’ End tote bags. I particularly eyed the Open Tote Bag in Navy Blue. As compared to LL Bean’s version, Lands’ End monochrome navy blue bag is taller and slimmer. The structure can fit folders and documents. I also appreciate Lands’ End provision for inner and outer pockets. LL Bean can provide pockets upon request for an additional fee. As for the monogramming services, Lands' End have more font selections and cheaper than LL Bean. So all the while, I'm convinced that Lands' End is the better brand. 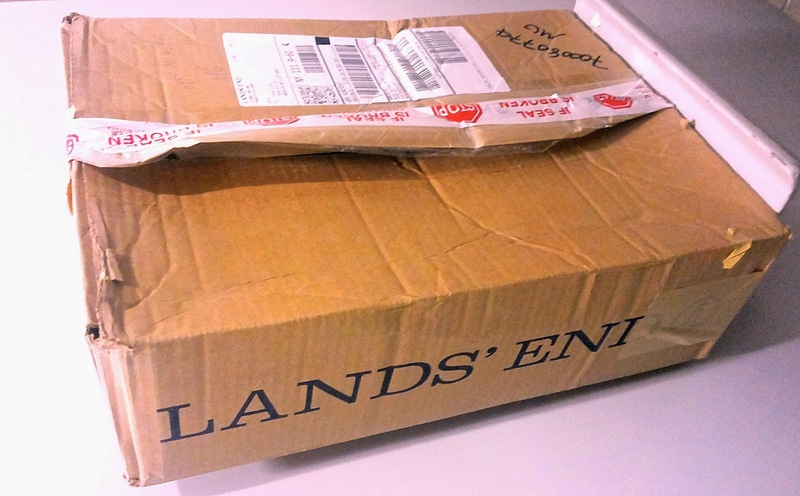 Lands’ End initially appeared cheaper. So without further research, I purchased the navy blue bag. As I was performing the last few phases of my online purchase, Lands’ End surprised me with additional fees. These included the state taxes and shipping fees. Unlike LL Bean, Lands’ End is charging higher taxes. This is something I can’t explain since I’m not adept with US tax rates. Another hidden disadvantage from Lands’ End is the shipping fees. LL Bean is way better because they provide free shipping, regardless of the amount purchased, within US and across Canada. 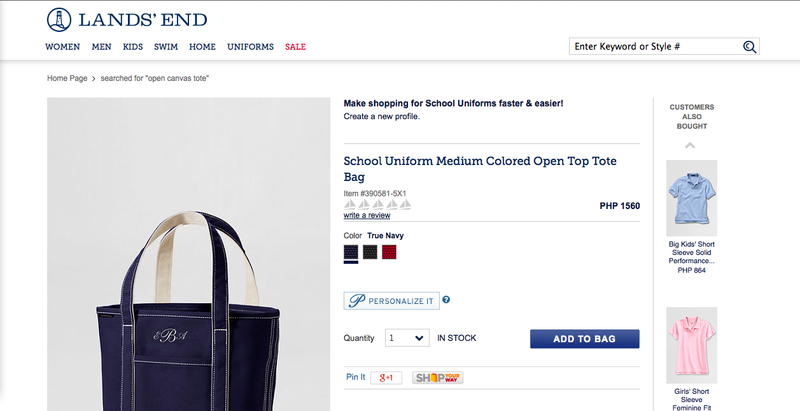 In the end, LANDS’ END CANVAS TOTE WAS MORE EXPENSIVE than LL Bean. Regardless of the surprising fees, I pursued the purchase. I had the bag shipped through this most talked about cargo forwarding company, Johnny Air. I followed Johnny Air’s shipping process. All the while, I thought that everything would run smoothly. Turns out, I discovered another implied shipping terms from Lands’ End. LANDS’ END DOES NOT PROVIDE TRACKING SERVICES for items less than 1 lb. How about that? I felt worried about everything. I kept thinking if my bag exceeded the weight requirement. To alleviate my worries, I decided to communicate with Lands’ End customer service officer through online chat. Unfortunately, Lands’ End customer service officer can’t answer my basic query. WILL MY BAG EXCEED THE WEIGHT REQUIREMENT? The officer answered, I don’t know and I don’t have the means to respond to such question. Oh Dear God! Rather than irritating myself, I decided to let go and wait. After several days, I tried to check the tracking status of my item. It led me to UPS’s site. There was finally a provision for tracking. A few days after, the worries and daily monitoring ended. My package arrived at Johnny Air’s US office. In a few more days, my package will reach me. According to the few reviews I read, it takes 7 to 10 days for US packages to reach Philippines. True enough, Johnny Air was able to deliver. The bag was forwarded to their branch in SM Megamall in 8 days. I thought everything would turn out fine again. I was later informed that I NEED TO PAY PHP 2,087 (around $ 52) for shipping fee. WHOA!!! And just like that, all the excitement went away. It was replaced with weakening knees and the frustration arising from my stupidity. To be honest, I was expecting to pay less than Php 1,000 (around $ 40) for a bag that amounts to less than Php 2,000 ($50). As it appears, Johnny Air’s shipping fee is almost equivalent to the price of the bag. I felt upset and stupid. I hate to admit it but I actually paid twice the price for the bag. Before deciding to avail Johnny Air, I already encountered a few bloggers who complained about the high and indeterminable fees imposed by Johnny Air. I just disregarded them. True enough, I now have my own taste of traumatic expenditure. I’m trying to console myself while typing this post. I’m trying to find reasons why paying Php 2,087 shipping fee is reasonable enough for an item amounting to Php 2,000. If I availed Lands' End's direct shipping to the Philippines, it might even appear cheaper with the custom fees. However, the problem with the local post office is the slow processing and as always, the element of uncertainty. When I claimed my bag from Johnny Air, I discovered the reason why I paid such surprising amount. The bag was enclosed in a huge box. I paid for the the exaggeratedly huge box. Lesson learned, huge boxes would cost a lot regardless of weight and contents. This is a disadvantage of using Johnny Air. 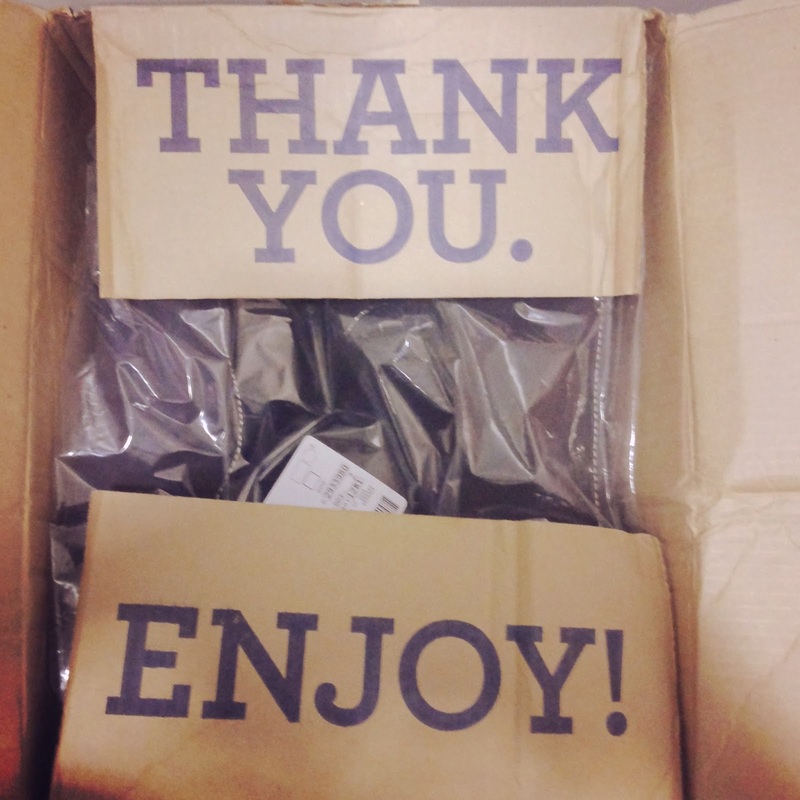 After the entire experience, here are the things I learned from Lands’ End and Johnny Air. 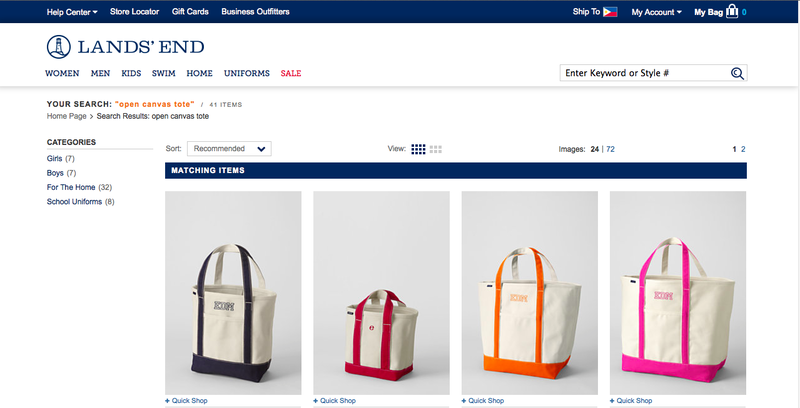 Lands’ End’s canvas bags appear cheaper compared to LL Bean. But after the taxes and shipping fees, Lands' End is more expensive. Monogram services of Lands' End is cheaper and choice of font are varied, as compared to LL Bean. However, the overall cost of the item with the shipping and taxes should also be considered. Lands’ End uses UPS for their tracking services. If your item, does not meet the 1 lb requirement, you will not be entitled to use the tracking facility. Online customer service chat representatives of Lands’ End are not highly equipped with information as to their products and services. Don’t expect to receive adequate customer support. LL Bean is way better in this area. In addition, you cannot use your Philippine based Paypal account with a US shipping address. If you have intentions of using cargo-forwarding companies in US, you cannot use your Philippine based Paypal account. Use your locally issued credit card instead. If you prefer speed of service delivery, consider Johnny Air. They deliver fast for a hefty price tag. In case you will avail Johnny Air’s services, please brace yourself for the soaring shipping fees. Johnny Air is imposing soaring fees for bulky and huge boxes. I’m still setting aside weight considerations. If you are willing to wait, you might want to consider Pobox.ph and other non-air shipping companies. It’s hard to determine the exact amount you have to pay to Johnny Air. Unlike, Pobox.ph, (I have yet to blog) shipping rates are clearly explained in their site. Johnny Air doesn't offer insurance for items shipped. (I saw it in the receipt I received. Maybe I can upload the receipt later.) This is again contrary to Pobox.ph, where shipping fees are inclusive of a maximum of $ 100 insurance in case of loss. Overall, I’m not saying that the two companies gave me a totally negative experience. My bag arrived with my desired specifications in the shortest possible time. There were just surprises and disappointments. Although I have to say that it would take me some time to repeat this very expensive experience. Despite all that, that's a really nice tote bag, especially with your monogram! How disappointing! I SO wish that Lands End had put your bag in a big padded envelope to ship it. I know you'll enjoy it though my friend and it will be worth it. Sweet hugs for a good week! I love your bag, Diane! As in! Thanks for sharing your experience with Johnny Air. I've experienced something similar to yours before, but with PhilPost and not Johnny Air. I ordered this bag from China and it has to be picked up from the post office in Pasay. Like you, I ended up paying more than the bag's price; plus, I was forced to take a leave of absence on the day I picked up the bag because the person who will release it reported so late at his desk na! Kung hindi lang sayang yung pinili ko ng super aga sa Post Office at hindi mahal yung bag eh iniwan ko na yun hehe! So I guess these things happen talaga. Haay, parang gusto ko na rin um-order nitong bag! Go! Order na :) Yun lang, be ready for the shipping fees. Minus the expensive shipping fees, ok naman talaga yung entire experience. I actually consider this bag as my pang-harabas bag hahaha Kasi matibay siya at kung magka-stain, ok lang because it's washable.